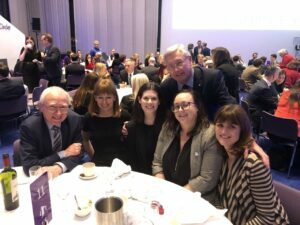 A team from our Private Client Department, along with partners John Ainley and Geoff Lamb, attended the Annual Dinner of the Society of Trust & Estate Practitioners (STEP) at the Bridgewater Hall in Manchester last night. John Ainley is a former Chairman of the Manchester Branch. Our Jennifer Kitchener was selected to attend the Dinner and honoured as a high achiever having attained some of the highest marks in the recent STEP examinations. Many congratulations to Jennifer who is a key member of our team dealing with Wills, Probate, Lasting Powers of Attorney and Trusts. The STEP exams are a prestigious specialist qualification which carries international recognition across all sectors of the commercial world. In addition to legal qualifications, North Ainley expects all our team to attain this high standard of academic and practical achievement. This entry was posted in North Ainley News, Private Client, Probate & Estate Adminstration. Bookmark the permalink. Both comments and trackbacks are currently closed.